I've always gotten good feedback on my quarterly routine posts, and find that they've been helpful to others for finding products that work for them. In return, I also stalk other peoples posts for ideas of what will work for me, but I digress. Since I started blogging years ago my skin has always been the same - oily in the winter, more oily in the summer, acne prone with hormonal cystic acne, and dehydrated. 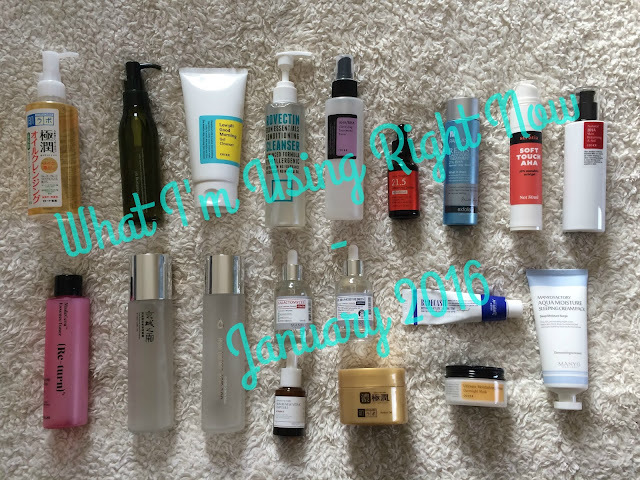 Over the past year, however, my skin has changed almost completely, and I find that my routine needs lots of tweaking (and not just because I want to try new products). So for the new years I want to post a monthly update of what I'm currently using, how my skin is acting, and what I'm really loving or wanting to try next. I think this will make a neat reference for me but I also hope some of you may find it useful as well! My skin is combo; dry around my mouth and on my cheeks, normal on my forehead, oily on my chin and nose. It's dehydrated, meaning it overproduces oil when I don't hydrate properly. I also have fine lines around my eyes (mostly due to stress) and hyperpigmentation due to residual sun damage and acne scarring. My skin is also sensitive to certain ingredients (like alcohol) and acne-prone (including regular hormonal cystic acne breakouts). For a few months now I've been using the Hada Labo Gokujun Cleansing Oil and I've enjoyed it for the most part. I don't know if anyone else remembers but for the past year before this I was using a huge bottle of the Elizavecca Olive Cleansing Oil and it quickly became my all-time favorite, but then it was suddenly unavailable on Memebox and needed a replacement, so I tried this. 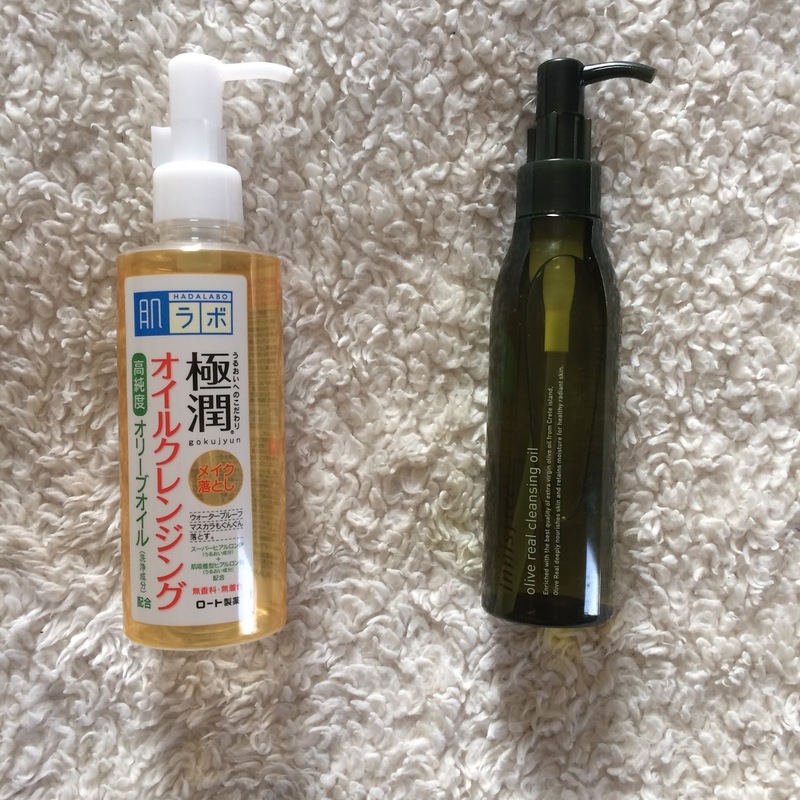 It's got nice ingredients and doesn't break me out, which are two big things I look at aside from whether or not it cleanses well (which it does) but it's very thin, and when I take the time to massage clogs out of my skin I want a thicker cleansing oil. So next up is the Innisfree Olive Real Cleansing Oil. I've previously used Innisfree's Apple Juicy Cleansing Oil and had no real complaints (other than that the scent can be a bit overwhelming if you are prone to migraines like I am) and thought I'd give this one a try. I've seen it mentioned on Instagram and Reddit in the past and with the olive oil I've been missing I thought it might end up being a real winner. I'll let you all know in February how that works out! Cleansers are something I really cannot commit to - unless it's the Cosrx Low pH Good Morning Cleansing Gel. 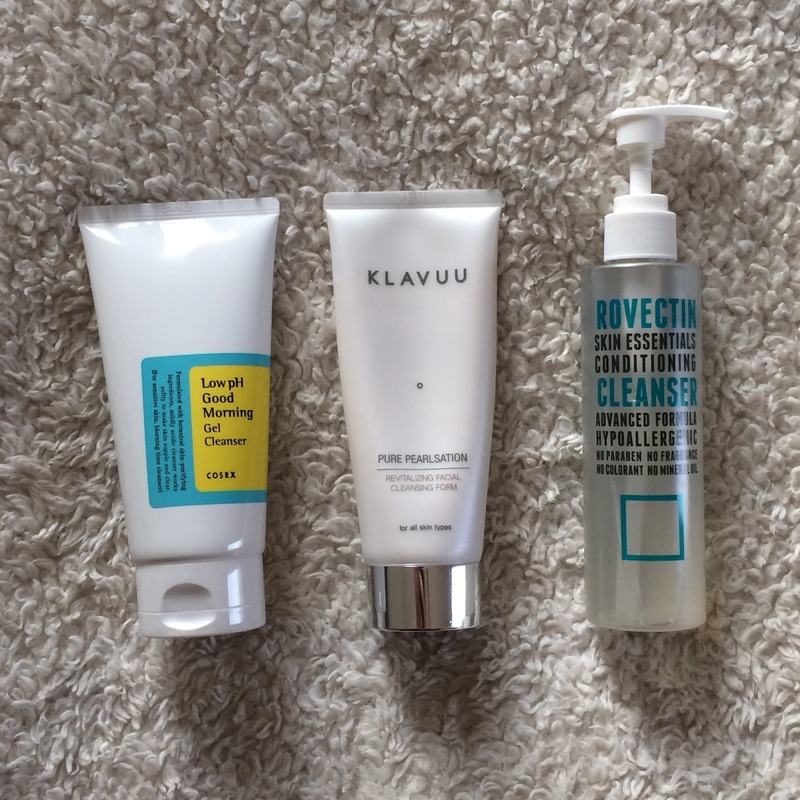 I was previously alternating between the Klavuu Pure Pearlsation Cleansing Foam* for a few months off and on and - but right now I'm testing out the Rovectin Skin Essentials Conditioning Cleanser* for a review and I love how soft it makes my skin feel. I've only been using it about a week so far but I already enjoy it and feel like it may soon be ranked right up there with Cosrx for me. When I am using actives I usually use a low pH toner beforehand, though it's usually not necessary. The main purpose of toning after cleansing for me is to pick up any residue left over rinsing my face - maybe I missed some suds or something, who knows! 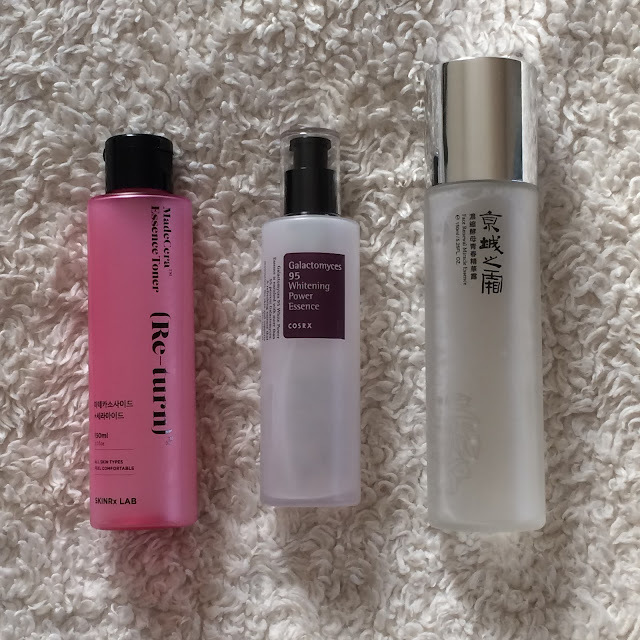 If I had to pick a ride-or-die toner it would be the Acwell Licorice pH Balancing Cleansing Toner, but it can be a little difficult to find these days so I just stick to the Cosrx AHA/BHA Clarifying Treatment Toner. I love the handy spray bottle and it does what I need it to do. I took a long break from traditional acids and opted for using Curology on a daily basis. The problem is, over the past few months I've noticed Curology isn't meshing with my skin the way it did when I initially started it over a year ago. I notice a quicker fading of hyperpigmentation when I use it, and that whiteheads heal faster and blackheads are fewer - but I also notice an increase in cystic acne that basically refuses to go away. I'm working on tweaking my prescription with my Curology dermatologist, but in the mean time I've been using good ol' BHA and AHA with a bit of Vitamin C mixed in too. Currently I'm using either Paula's Choise RESIST Daily Pore-Refining Treatment 2% BHA or the Stratia Soft Touch AHA in the evenings, and have been trying to finish up a bottle of C21.5 Pure Vitamin C Advanced Serum in the mornings. 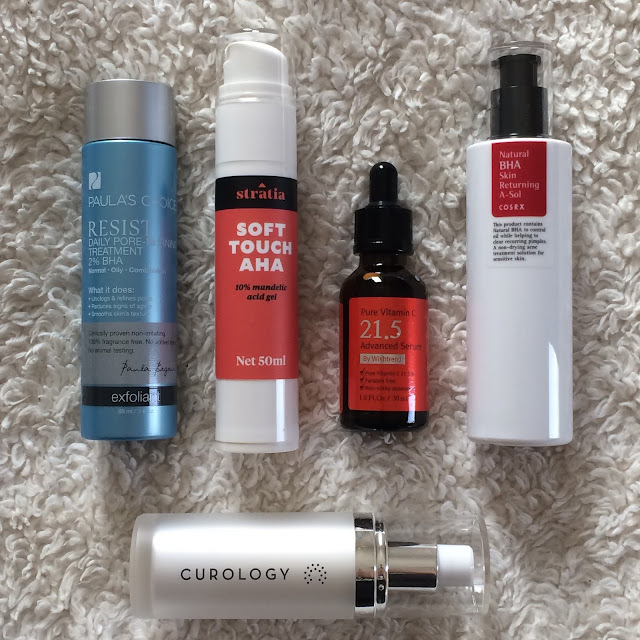 I occationally spot treat with the Cosrx Natural BHA Skin Returning A-sol after applying actives to my whole face too, but I don't use it too often because the alcohol content in this can be drying to my already dehydrated skin. I rely on my FTE to prep my skin for the remainder of my routine and allow it to absorb more efficiently. 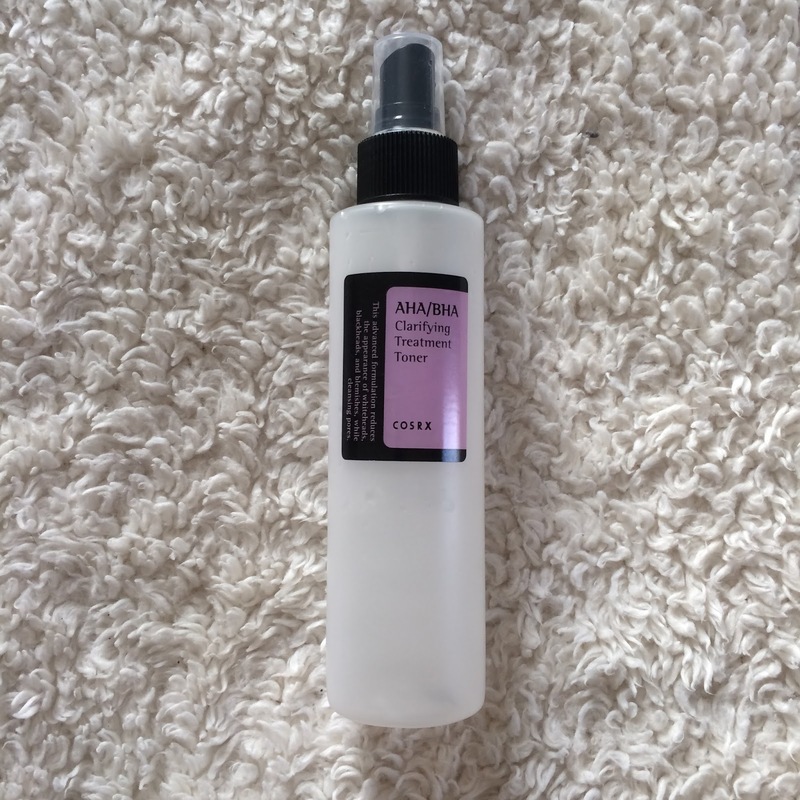 If I'm not using any actives I apply the SkinRx Lab MadeCera Essence Toner with a cotton pad to both hydrate and repair my skin while picking up residue from cleansing - but if I'm applying after actives I splash some in my palms and pat it into my skin. I like to follow my toner with a fermented product like the Cosrx Galactomyces 95 Whitening Power Essence, but for the past couple months I've been alternating it with the Naruko Face Renewal Miracle Essence*. I will admit that the first month or so the Naruko was a flop for me and I've been struggling to collect definitive thoughts on it, but lately I've been feeling a little more love towards it so I hope it's starting to grow on me. I tend to think of all the liquids between my FTE and sheet masking one big lump of mini steps to target specific concerns, and just apply them all in order of thinnest to thickest. I tend to start off this step with some hyaluronic acid because it can hold up to 1,000 times it's weight in water, and pulls moisture deeper into the skin - making it perfect to combat the dehydration. 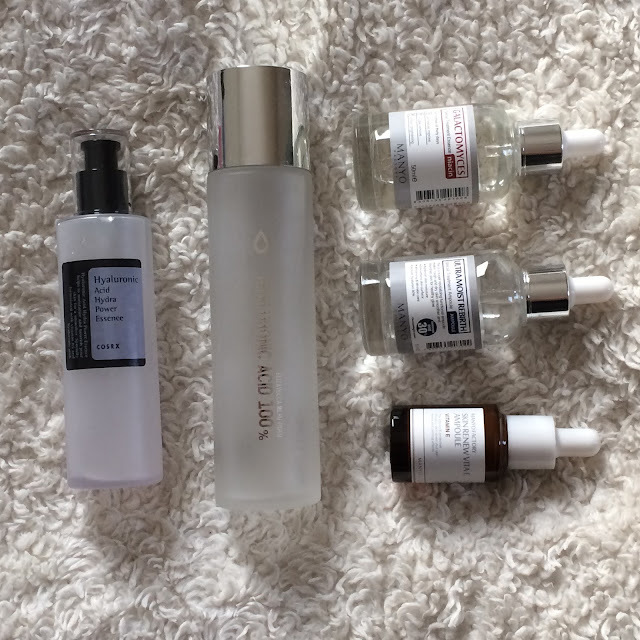 My favorite is the Cosrx Hyaluronic Acid Hydra Power Essence, but I've been using the Elizavecca Milky Piggy Hyaluronic Acid 100% Serum* for a while now and like that too. It can be a bit sticky, which does not happen with the Cosrx, but that goes away once I apply my next layer. There's quite a bit left of the Elizavecca but I've already been beginning to alternate it with the Manyo Factory Galactomyces Niacin, which I think offers a nice brightening effect on the days I use it. I've also been easing the Manyo Factory Ultra Moist Rebirth Ampoule and the Manyo Factory Skin Renew Vita-E Ampoule into my routine over the past couple weeks. I tend to use a sheet mask right before applying my moisturizer or sleeping pack. I don't typically share my sheet masks on the blog but you can always see what I'm using daily or every other day on Instagram at @halfpastoctober. Having dehydrated skin means I need to seal in all my hard work, but having acne-prone skin means I have to be very conscious of what I'm sealing my skin with. 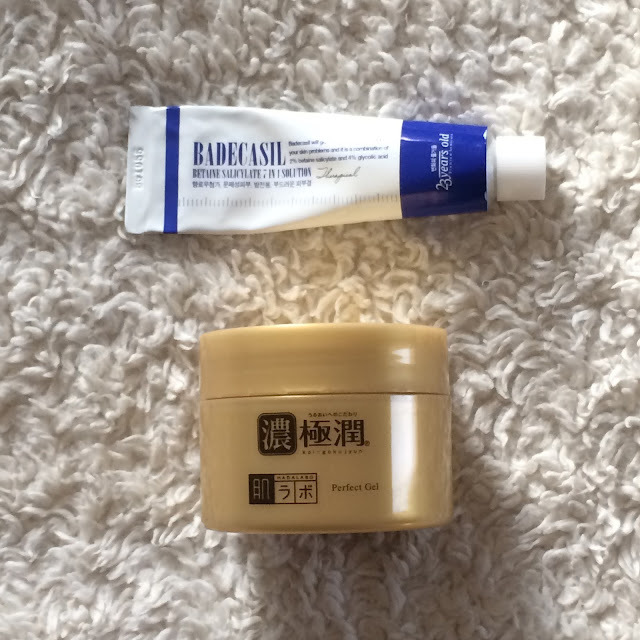 My current go-to's for moisture are the Hada Labo Gokujyun Perfect Gel when my skin is fairly balanced, or the 23Years Old Badecasil Cream for days my skin is congested, flaky, oily or needs the extra exfoliation. My go-to sleeping pack for over a year now has been the Cosrx Ultimate Moisturizing Honey Overnight Mask. It's lightweight but super hydrating, and contains propolis which helps with all my main concerns: acne, brightening, and anti-aging. 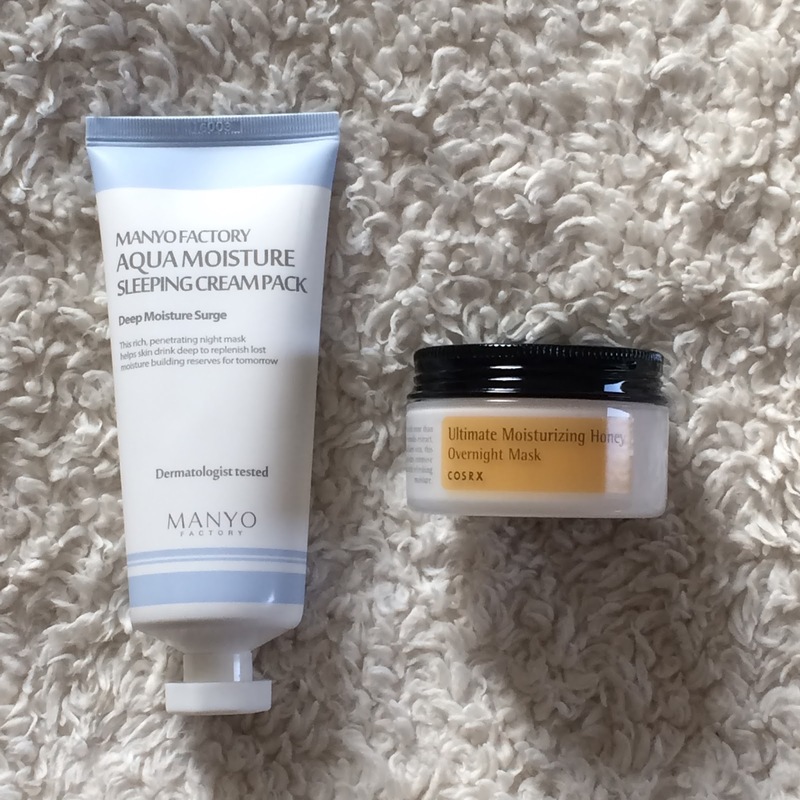 Simone from CanIPutItOnMyFace sent me the Manyo Factory Aqua Moisture Sleeping Cream Pack a while ago and I've been testing it for about a week now, and so far I'm pleased with the results - but of course will give it some more time before sharing my thoughts. I'll update you all next month how these products have been working for me, and if there are any new products I've swapped these out for, or have added to my main routine. If you're interested in trying any of these items for yourself, please check out my Discounts, Promotions & Affiliates page with links and info on how to save yourself some money, or support this blog. I always enjoy reading reviews about products from other people before I go out and purchase the product for myself! I appreciate this :) Thanks so much!